Over the past three months, Mass Oyster has been working with students from Harvard's Graduate School of Design. Kelly Murphy and Jenny Corlett have been joys to work with as they have thought about the tremendous volume of oyster shell that is wasted as it winds up in landfills around the state. Here is a link to Kelly's blog, which discusses their work. They estimate that 300,000 pounds of oyster shell are wasted each year by Boston Restaurants alone. They also developed a cage concept for oyster gardening. 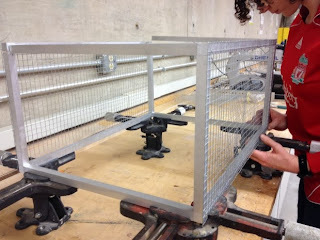 Jen Corlett manufacturing an oyster cage. We particularly liked this video. And here is their final presentation. AQUAPLOT">http://vimeo.com/81763253">AQUAPLOT: an oyster garden proposal for Boston. With an oyster sampling, how could they not knock the cover off the ball! 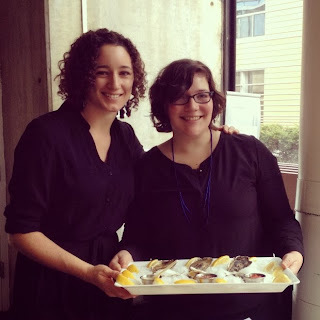 Oyster Shucking at the Final Presentation. You may recognize the face of Deniz Bertuna Wellfleet oyster restoration intern MOP sponsored this summer. The East Coast Shellfish Research Institute, an arm of the East Coast Shellfish Growers Association, has received a grant from USDA/NIFA Risk Management Education Northeast Center to do a workshop in all of the northeast coastal states. The focus of these workshops is to help growers document the environmental soundness of their operation, show how this extremely simple technology can improve their profitability, learn something new and relevant, and understand what to do in case of mortalities in field growout. Would you like to show your customers and consumers that you really are an environmentally aware shellfish farmer? Would you like to improve the marketing for your crop, as well as know what to do if you have a major mortality? And maybe why it’s a good idea to keep decent production records? Well, this workshop may just be the thing for you! We will have some hands-on work documenting your operation into an Individual Farm Plan, show how to create a Point of Purchase brochure, learn some other new things, and get some personal attention for growing your future success. The workshops are free of charge but we’d like you to RSVP to your state Aquaculture Extension Specialist about your participation. We may send some other suggestions about what to bring with you to help the process. Attendees are invited to bring with them all the information they would need to complete the plan (actually not much…state permit numbers mostly). They would create the trifold brochure at home on their own after instruction at the workshop, but people on the grant would be available by phone or email to help with those also after the workshops. So, put these dates on your calendar so you can attend. For Oyster Restoration Maryland Imports 100 Tons of Fossil Shell from Florida. The article below was in the Miami Herald. The irony of this situation is that around the country thousands of pounds of oyster shell are thrown away every day. As Mass Oyster's shell recycling program gains momentum we hopefully will capture more of this valuable waste stream and begin putting it to work. To that end, we recently met with a local town's Conservation Committee to pitch the idea of using the shell to create a platform for young oysters to settle on. We will be following up with their Town Council early next year. The volumes are astounding! 50 train cars every 10 days- from now through September. Will there be anything of Florida left when they are done? Note that the National Fish and Wildlife Service is involved. Yet again Federal dollars are flowing to other states. And the Bay State is just beginning to see stirrings in town in the Cape. Come on! Lets tap into those Federal dollars, improve our estuaries and create some jobs. ANNAPOLIS, Md. -- The first of several shipments containing more than 100,000 tons of fossilized oyster shells was scheduled to be unveiled Friday as part of a public-private partnership to help rebuild habitat in oyster sanctuaries on Maryland's Eastern Shore. Gov. Martin O'Malley was scheduled to attend an event at the Port of Baltimore to show the first 2,750 tons. The shells have been shipped from a Florida quarry in a partnership with CSX, which will be transporting 112,500 tons of the fossilized shells by train over the next nine months. The shells are headed to reef restoration initiatives in Harris Creek and the Little Choptank River. The Maryland Department of Natural Resources spent about $6.3 million to acquire the shells. "Innovative programs and partnerships like these are making our record investments in restoration, aquaculture, stewardship and enforcement possible," O'Malley said in a statement. Maryland does not have natural and affordable shells available to support restoration of the 377-acre Harris Creek sanctuary, so the natural resources department bought the fossilized shells from Gulf Coast Aggregates near Carrabelle, Fla. The National Fish and Wildlife Foundation negotiated an agreement with CSX to transport the shells, the department said. Rail Cars for moving recycled shell. Under the agreement, CSX will transport about 50 train cars of fossilized shells to Curtis Bay every 10 to 14 days between now and September. The shells will then be sent by barge to the Eastern Shore sanctuaries. The University of Maryland Center for Environmental Science and the Oyster Recovery Partnership will produce young oysters and put them on the new reefs. "The collaboration is monumental as it allows us to complete the substrate construction of the largest tributary-focused oyster reef restoration project on the East Coast, possibly the nation," said Stephan Abel, Oyster Recovery Partnership's executive director. "In all, more shell will be placed in Maryland waters over the next nine months than in the past decade, enough to cover 80 football fields with shell 12 inches deep." In October, O'Malley announced that the state and its partners produced and planted 1.25 billion oysters this year. 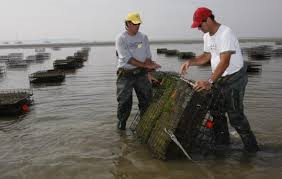 In 2010, O'Malley launched the Oyster Restoration and Aquaculture Development Plan in hopes of rejuvenating the state's languishing oyster population. Until now, the easiest way to enjoy Island Creek Oysters was to visit a fine sea food restaurant and order off the menu. Or if you were adept with a shucking knife to order them through their web-site. That will soon change as the high profile aquaculture farm plans to open a retail location in its Duxbury hometown next week. Island Creek Oystermen hard at work. The shop is on Parks Street, the home of Bennett Lobster & Seafood, which Island Creek Oysters founder and owner Skip Bennett has operated for some time. In addition to oysters, the store will sell razor clams, littleneck clams and shrimp prepared using a family recipe. While less known razor clams make for a delightful change from littlenecks and cook up well. In 2010, Bennett and two Boston restaurant veterans launched the popular dining hotspot Island Creek Oyster Bar at Kenmore Square. The team is not all commercial. They were very helpful to the Mass Oyster Project in its early days as we sought to become active in oyster restoration. We cannot say enough good things about Skip and his team. And through the Island Creek Foundation, Bennett has built a shellfish hatchery in Tanzania in an effort to provide more food for Africa. This just in from the Commonwealth's Division of Ecological Restoration. An important goal of this transition is to quickly restore staff capacity. Toward that end, we have just posted a vacancy announcement for an Aquatic Habitat Restoration Specialist. This position will serve as a senior restoration project manager. The deadline for applications is January 8, 2014. A copy of the announcement is posted on the DER website home page, and can also be viewed on the Commonwealth’s Employment Opportunities website. Please help us spread the word to groups, lists, and individuals that might be interested. Once you are hired- Mass Oyster would like to work with you. There is $100 million in Hurricane Sandy recovery grants waiting to be awarded. It would be great if we could lock arms and bring a piece of that to the Bay State. Mass Oyster cannot do it alone. We need the support of the State to capture those funds and create those jobs. We saw this story on the wires and found it bitter-sweet. A Beverly, Massachusetts firm doing great things to help oyster restoration. But not here in Massachusetts. Longtime readers of this blog will see this as a continuation of a long-term trend. 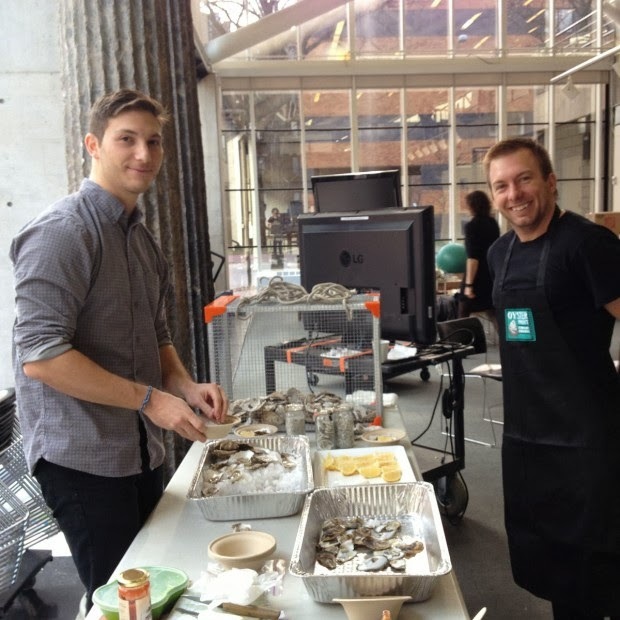 Beverly, MA - Xylem’s YSI Integrated Systems and Services (ISS) has teamed up with the Urban Assembly New York Harbor School (The Harbor School) and Verizon to collaborate on the Billion Oyster Project (BOP). The project was developed as a long-term oyster restoration project, to restore native oyster species back in to New York Harbor and surrounding estuaries and waterways. 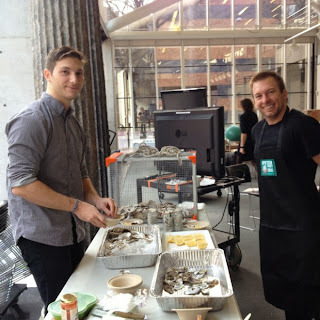 The Billion Oyster Project is a program to restore one billion live oysters into New York Harbor over the next 20 years. The environmental benefits from such a project are countless, but certainly the improvement of water quality as a result of the presence of the oysters, will have a lasting effect on the NY Harbor ecosystem. The project begins at the oyster hatchery at The Harbor School on Governor’s Island, a public high school with a focus on marine science and marine technology. The Verizon Innovation Program funded an effort at The Harbor School which enables the high school students to track the project in real-time, with underwater video and data collection delivered over Verizon’s 4GLTE network. For YSI, the cutting edge solution started with a highly specialized electronics chest. To meet the requirements of the project, the chest was entirely re-designed by ISS to be completely submersible. It was also ruggedized to be hurricane resistant, as a result of some of the devastation and challenges that came to light in the wake of Hurricane Sandy. ISS then custom designed a system that integrated the EXO Water Quality Sonde (which monitors eight different parameters) and the SonTek Argonaut XR (which provides water velocity and temperature data). Both instruments are hard-wired to the electronics chest, as is the video feed cable. Inside the chest is the datalogger and cellular modem for real-time transmission of the data and the live video feed from the harbor floor. ISS worked closely with the Xylem products teams, as well as the underwater video manufacturer, Wild Goose Imaging, to collaborate on the solution. The high school students involved in the project can access the data and the video feed at any time through The Harbor School web site. The data will also be made available to the general public, so as to support technology education for others around the globe. Xylem’s analytics businesses are leading manufacturers of premium field, portable, laboratory and online analytical instruments used in water and wastewater, environmental, food and beverage, pharmaceutical and life science applications. The company’s meters, sensors, analyzers and related consumables are used every day by thousands of end-users worldwide to analyze and control quality in countless industrial applications where precise measurement is required. Xylem’s analytics business has been created over the past three years with a series of acquisitions, including OI Analytical, YSI and MJK Automation, which have been added to the core businesses of WTW, SI Analytics, Aanderaa Data Instruments (AADI), Global Water Instrumentation, ebro and Bellingham & Stanley. www.xylemanalytics.com. Xylem (NYSE: XYL) is a leading global water technology provider, enabling customers to transport, treat, test and efficiently use water in public utility, residential and commercial building services, industrial and agricultural settings. The company does business in more than 150 countries through a number of market-leading product brands, and its people bring broad applications expertise with a strong focus on finding local solutions to the world’s most challenging water and wastewater problems. Xylem is headquartered in White Plains, N.Y., with 2012 annual revenues of $3.8 billion and approximately 12,900 employees worldwide. Xylem has been named to the Dow Jones Sustainability World Index for the last two years for advancing sustainable business practices and solutions worldwide. The name Xylem is derived from classical Greek and is the tissue that transports water in plants, highlighting the engineering efficiency of our water-centric business by linking it with the best water transportation of all -- that which occurs in nature. For more information, please visit at www.xyleminc.com.